In a newly published paper, Swedish Education Exhibitions and Aesthetic Governing at World´s Fairs in the Late Nineteenth Century, Christian Lundahl discuss what can be considered an important aspect of the pre-history of international large scale assessments such as PISA – the comparative logic of school exhibits. The purpose of the paper is to shed light on the relations between Swedish education and the international scene when it comes to policy and practice formation. The field of study is the international World´s Fairs of 1862–1904. Looking at what Sweden displayed, and understanding how visitors perceived it, the paper raises questions concerning how exhibitions like these worked as mediators of educational ideals. The focus is on the dissemination of aesthetic ideals, and the paper shows that the World’s Fairs were platforms for an aesthetic normativity that had governing effects locally as well as globally. All the awards Sweden received at international exhibitions 100 years ago makes a sharp contrast to the present image of Swedish education as a system in severe crisis. One of the more successful exhibitions in this regard was the exhibition at St. Louis 1904 (pic 1). Pic 1. Prizes awarded to the Swedish school exhibition in various categories. Picture from The Swedish School museum archive, Nordiska museets arkiv. Normally education was a minor part of the international World’s fairs. Sweden though had made an effort in presenting its education system in an ambitious way already in London 1862, Paris 1867, London 1871, Vienna 1873 and Philadelphia 1876 (Lundahl & Lawn 2014). In St. Louis 1904 even greater effort was put in since the Swedish government decided to prioritise its display on education. For this investment the Swedish Department of education (Ecklesiastikdepartementet) received both Grand prizes and Gold medals (pic 1). If we magnify the signs directly to the left after entering the Swedish pavilion, we see that they read Common schools (pic 2). Clearly education had a central place, directly at the entrance to the Swedish exhibition. A sign of pried one can imagine. Pic 2. 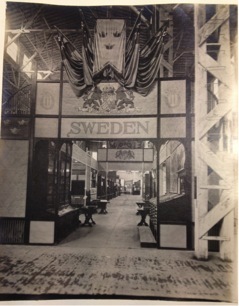 Entrance to the Swedish pavilion. 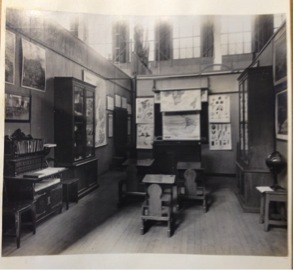 Picture from The Swedish School museum archive, Nordiska museets arkiv. So, what was Sweden so proud of when it came to education? 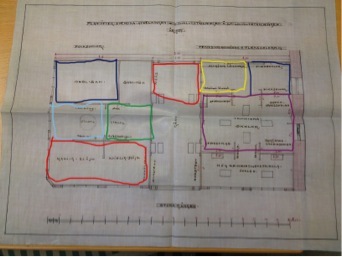 If we look closely at the plan for the Swedish display we see that it very much comprehend the various forms of education in Sweden: dark blue large area – boys primary school; dark blue small area – girls education; yellow – grammar and secondary school; purple – evening schools, vocational schools, adult education (pic 3). The exhibition also seems to display a model of inclusion of the outskirts of the educational landscape into a comprehensive structure (linking adult education, education in arts, sloyd and drill etc. to a more modern notion of education). The exclusive grammar- and upper secondary education is just a minor part of this exhibition, displayed in the back of the room. The prestigious Boarding school Lundsberg only received a Bronze medal for its part in the exhibition (pic 1). Pic 3. Plan of the Swedish display on education. Colourmarks added here. Picture from The Swedish School museum archive, Nordiska museets arkiv. When it comes to the question of what to highlight from primary education it is interesting to see how much room is afforded to the relatively novel subjects of Sloyd (red) and Arts/drawing and gymnastics (light blue and green). There is also a room about the new subject Kitchen training (pic 7). If we look at the primary school classroom model we get a hint that “Object teaching” is at fore, displaying various maps, charts, globes and monitors with stuffed animals (pic 4). But Sweden was also awarded for its collection of educational literature in a Pedagogical library (pic 1). Pic 4. 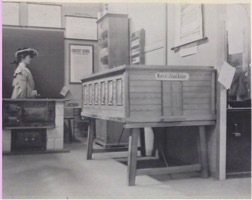 Model of a primary school classroom. Picture from The Swedish School museum archive, Nordiska museets arkiv. The from an international perspective relatively unique subjects of Sloyd and Gymnastics got plenty of room, and a lot of different teaching material were displayed as well as drawings illustrating how to actually use them (pic 5 and 6). Pic 5. Sloyd. Picture from The Swedish School museum archive, Nordiska museets arkiv. Pic 6. Gymnastics, drill. Picture from The Swedish School museum archive, Nordiska museets arkiv. Finally we also see how Sweden displayed a model of a school kitchen for the subject of Kitchen training (pic 7). Pic 7. Model of a Swedish school kitchen. 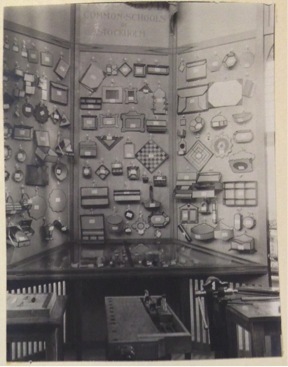 Picture from The Swedish School museum archive, Nordiska museets arkiv. We have elsewhere described these exhibitions as a national flag (Lundahl & Lawn 2014). The Swedish state funded a major investment in the Swedish exhibitions and with each exhibition, it became more sophisticated; from a collection of artefacts and a dark display to a standalone, complex full scale school. The exhibited objects change from merely books and maps to also include examples of new national pedagogical ideas (eg. Sloyd) and comprehensive descriptions of the educational system as a whole (Lundahl & Lawn 2014). The exhibition at St Luis 1904 provided a comprehensive overview of the educational system at large, but the actual space and place of the various objects at display reveal a lack of representativeness. These exhibitions were a plattform for progressive reforms – not showing or sharing what the reality looked like, but what was about to come. Today, maybe more than ever, the international scene is an important place from where school reforms can be modelled, but in Sweden nowadays it tends to be done by telling everyone how poor the school system is and that is was better before, rather than by lifting hopes and ideas for a renewal in terms of structures, subjects and teaching. Today we often use Google when we want to learn something new, for example about education. The function of Google is similar to that of World’s fairs in the late 19th century. It provides a relatively comprehensive overview of things that might interest you. One way of getting inspired from other countries education systems in the late 19th C was to take the train to Paris or Vienna, or even take the boat to USA and visit one of the large World’s fair’s education exhibits. There it was possible to meet an excessive collection of teaching materials, and even teaching methods. 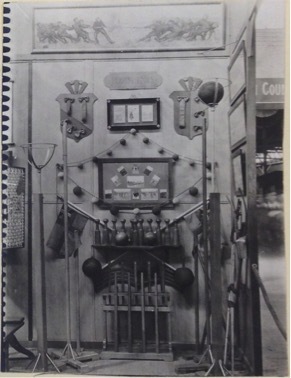 The things displayed at the World’s fairs were not really representative, but carefully selected (Lundahl & Lawn 2014). If we on the other hand turn to Google and ask what present education look like we get so many answers that it is almost impossible to sort among them. One way of overviewing them is by searching a topic with Google images. Pictures can often pinpoint dominant discourses (Fairclough 1992). One interesting question then, is what does the PISA test, or rather the discourse about it, look like. In this picture we see charts and tables illustrating comparisons on differences in outcome. 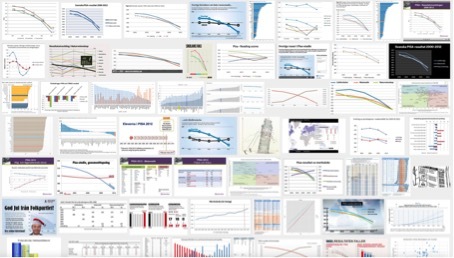 We see that the people constructing these charts often want to illustrate that some outcomes are better then others – there is a slope in most of them. 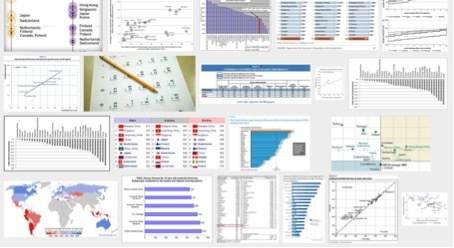 If we scroll among the Google images about PISA we see some variations where also the international foci becomes more prevailing (Pic 2), but we see very few examples of content, i.e. questions asked in these tests or information about test taking processes. In a new Phd-theses Margareta Serder (2015) for example suggests, in an analysis based on PISA documents, that low performers appear as threats to the future society, due to the risk that they would become ineffective citizens. Meanwhile, other studies assert that standardized comparison is a practice that, when frequently repeated, contributes to lower results and an increasing disillusion of low achievers. Serder proposes that PISA, rather than to be seen as a knowledge measurement, should be regarded as a knowledge actor. In other words, PISA produces another reality than it measures – while measuring. Sweden is a good example of that. When Sweden started to drop in the PISA rankings 2006, Swedish politicians proclaimed an educational crisis, even if the scores still were quite decent. This paved the way for several reforms aiming at increased testing and control, which at least haven’t solved the problem with dropping PISA-results. Today PISA is synonymous to crises in Swedish educational discourse, which becomes evident when we search Google images for ‘Sverige’ (Sweden) and ‘PISA’ (Pic 3). Compared to the international images of PISA this collage illustrates that PISA in Sweden is used to illustrate a negative trend when it comes to school quality – a downfall. Why Sweden fails in PISA and what to do about it is an interesting question, but based on these images we can also raise questions of another kind: what knowledge travels, where does it go and through what media. What shapes does knowledge about education have and when does it change its shapes and for what reason? Images like the ones in Pic 1 – 3 are the perfect “quick language” (Lundahl 2008). They transfer fast, and allows for translations without a spoken word. They can be correctly understood or misunderstood, it doesn’t really matter – they can become meaningful in new ways from the perspective of the spectators. If we consider PISA as a knowledge actor it produces images and idols through which it becomes an ontological reality that reach into space and time in a similar way as the old World’s fairs did. Clearly PISA fosters winners and loser. There is only room for a few top-performing countries. Also in the old World’s fairs competition was a major reason to participate. The spectators however met all of the variation and could with their own eyes and hands try to assess the quality of the exhibition. PISA is not really open to laymen assessment in that way. 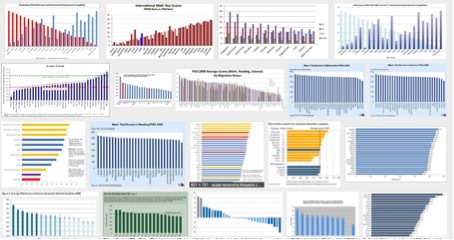 We see the differences in numbers, ranking and charts but what does it mean? What do the children really know or not? Visualised with the help of Google images one kind of PISA discourse is revealed, and regardless of its meaning, as purely a representation there is a kind of beauty in PISA. Lundahl, C. (2008): Inter/national assessments as national curriculum: the case of Sweden. Martin Lawn (ed): An Atlantic Crossing? The work of the International Examination Inquiry, its researchers, methods and influence. Oxford: Symposium Books, 157-180. Serder, M. (2015). Möten med PISA: Kunskapsmätning som samspel mellan elever och provuppgifter i och om naturvetenskap. Diss. Studies in Educational Sciences, no 75. Högskolan i Malmö.